It seems as if the tension between Lakers coach Mike D’Antoni and Pau Gasol has reached a boiling point, and now the Lakers reportedly are taking trade offers for the 7-footer. Since D’Antoni took over the Lakers, Gasol’s "to the rim" style of aggressive play seems to be showing less and his numbers have dropped as a result. This week Gasol made it clear that he does not feel like the ball is getting to him enough in the post and that was his reasoning for not being as offensively effective as in the past. He’s shooting a career-low 41.7 percent from the field and averaging 14.4 ppg (down four points from the ’11-’12 season before D’Antoni took over). 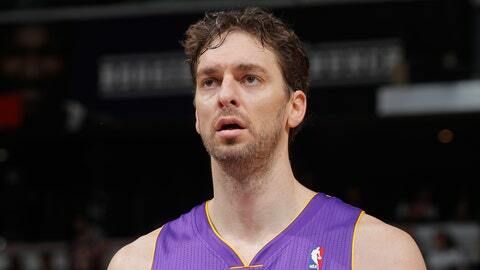 Gasol is also averaging a career low in minutes (30.3) and just 3.3 free-throw attempts per game. Thursday, the Lakers big man took his frustration to reporters saying his role is "not ideal." Well, Friday morning D’Antoni responded without holding his tongue. "It’s also a nice excuse not to play hard," D’Antoni said. "That’s a classic, ‘I don’t know what I’m supposed to do.’ Well, you don’t have trouble getting up to the paystub line. You know what you need to do to get your check. You know what to do. They will. They’ll figure it out. "That’s one thing. They don’t want to do it that way. I understand that. That’s when you have to accept it or not. But there’s no reason not to play hard." D’Antoni also made it clear that while Gasol is complaining about not getting the ball in the post, the worst thing the Lakers do on paper is post play. The coach is absolutely correct about that. The Lakers sit at the bottom of the NBA in post-up efficiency, averaging only 0.656 points per possession, according to Synergy Sports. Things just don’t seem to be clicking in Tinsel Town and what’s the point in holding on when both parties involved are not benefiting? Gasol even hinted at the idea of joining the Grizzlies. They know what to do with players that do their thing in the post such as Zach Randolph and even the other Gasol. His brother, Marc. "It’s appealing," Pau Gasol told NBA.com. "One of the best centers in the NBA, one of the best interior players, is my brother. There’s a lot of attractive factors there. But who knows if that’s even a possibility or if that will ever happen." The decline in Pau Gasol’s numbers could show that the system D’Antoni is running just doesn’t fit his talents or that the 33-year-old veteran’s best days are behind him. It might be time for the Lakers to seriously consider getting someone of substance for the big man while they still have the opportunity to do so. They need help in the front court with center Chris Kaman being banged up and Jordan Hill the only other big man with any star potential. Gasol’s three straight Finals appearances with Kobe Bryant and Co. were cool, but maybe his days in the purple and gold should be coming to an end.